BPP disowns the position of its lawmaker. President Petro Poroshenko condemned the act of the MP Oleksiy Honcharenko, who has spray-painted a fragment of the Berlin Wall opposite the German Embassy in Kyiv. "Such a behavior of a people's deputy is absolutely unacceptable. It is his private position which was condemned, as far as I know, by his faction and does not reflect the position of the political force," the president said at a joint news conference with Greek Prime Minister Alexis Tsipras. 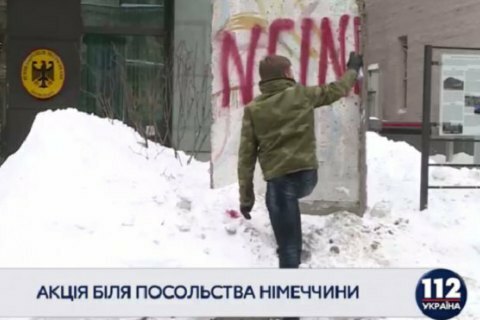 Honcharenko spray-painted the word "nein" on the fragment of the Berlin Wall in front of the embassy. He told reporters that he did it as a protest against the previous statements of German Ambassador Ernst Reichel about the elections in Donbas. Kyiv Prosecutor's Office opened criminal proceedings on charges of hooliganism against Honcharenko.